Now that you’ve completed the exclusive Lovefraud checklist of sociopathic traits, are you concerned? Did many of the traits and behaviors sound like your partner? 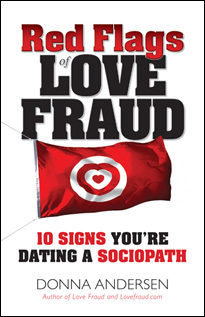 Red Flags of Love Fraud, by Donna Andersen, will give you much more detail to help you decide if your partner is a sociopath. But that’s only the beginning of how this book will help you. It will also explain how you were hooked, how to escape and how to protect yourself, so that it never happens again. In fact, many readers have said that Red Flags of Love Fraud saved their lives. Chapter 2 What is a sociopath? You can have the Red Flags of Lovefraud ebook delivered to you instantly, or have the printed version shipped to you, right away. And when you buy directly from Lovefraud, you save 20%! Red Flags of Love Fraud 10 signs you’re dating a sociopath reveals, for the first time, the tactics of social predators who pursue romantic relationships not for love, but for exploitation. This book explains how sociopaths seduce their targets, why it’s hard to escape the relationships, and how you can protect yourself. Buy the Red Flags of Love Fraud ebook or printed book directly from Lovefraud now and save 20%!